Physical rehabilitation is a method widely used in our chiropractic offices to aid in the recovery from your injury. Types of treatment that are grouped into this category all focus on improving biomechanics through proper function of joints and soft tissues in the body. How do I know if Physical Rehabilitation is for me? Our doctors will help you determine if physical rehabilitation is right for you. Not everyone is a candidate, but the vast majority of our patients undergo some form of this type of care. 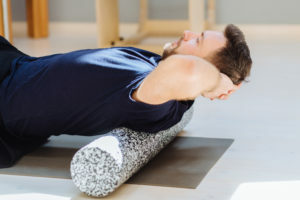 In fact, it’s our goal to introduce you to this, because many of the strengthening and flexibility programs that we prescribe for our patients can be done in the comfort of their home. After we help guide you through your program we will review the exercises you should do daily to prevent the same problems from recurring again! No treatment program is a like, for any service at our facilities. In fact, it’s often that you won’t go through the same procedures each time you attend an appointment at our offices! Our doctors perform regular evaluations to update your care plan and to appropriately adapt your physical rehabilitation program. Is Physical Rehabilitation covered under my insurance policy? Most insurance policies will reimburse for services that are associated with physical rehabilitation in our chiropractic offices. In the rare instance that they do not, we have options for you! We want this to be the least of your concerns if this has been prescribed by one of our doctors to enhance your recovery.